There have been several protests in the last few days in a group of Arabic-speaking countries – Egypt, Yemen, Tunisia, and Jordan. What’s causing all these protests? It all started in Tunisia in December. People were unhappy with their government. There weren’t enough jobs, food prices were shooting up, and houses were getting more unaffordable. 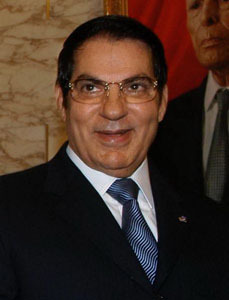 After weeks of protesting, rioting, and fighting with the police, the people of Tunisia forced their country’s leader, President Zine al-Abidine Ben Ali, to step down from his role as president. He fled to Saudi Arabia on January 14. He had been in power for the last 23 years. Protests are still continuing in the country, and more people who were part of the government are stepping down. Elections are expected to be held in a few months to choose the next government. The fact that Tunisians were able to change their government inspired people in some other countries who have been unhappy for similar reasons. Protests have been going on in Yemen. The leader of Yemen, President Ali Abdullah Salih, has been in power for 32 years. Yemen used to be two countries, which were united in 1990 to create Yemen. Salih was the leader of one of the countries that formed Yemen before 1990, and continued to be the leader of Yemen. One of the demands of the protesters is for Salih to step down. Jordanians took to the streets and asked for some of their country’s ministers to step down. Jordan’s head of the country is a king. King Abdullah II bin al-Hussein has been the king since 1999, and his father was also the King of Jordan before him for 46 years. In Egypt, there have been many riots. Some people have been killed, and hundreds of people have been arrested. Egypt’s current president, Hosni Mubarak, has been the leader for almost 30 years. One of the people’s demands is for Mubarak to step down.